If you think you have an allergy, tell your Physician about the symptoms you are having, when they happen, how often they occur and if anything seems to trigger them. Your Physician can offer advice and treatment for mild allergies. If you require allergy testing or specialist advice, you may be referred to an allergy clinic. If you have a severe or complex allergy, you may need to be seen at one of the larger allergy centres. There are a variety of allergy tests available to help make an accurate diagnosis. These are described below. The test involves putting a drop of liquid allergen onto your forearm, followed by a gentle pin prick through the drop. 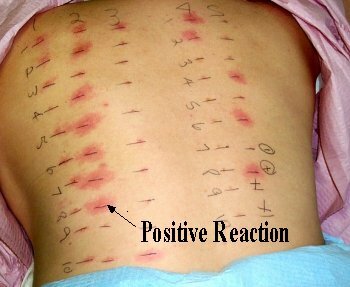 If you are allergic to the substance, an itchy, red bump will appear within 15 minutes. Skin prick testing is very safe and can be performed in people of all ages. Antihistamines interfere with the results, so they need to be stopped for several days before the test. Intradermal testing involves injecting a watered-down allergen into the top layer of skin with a very fine needle. It is slightly more painful than the skin prick test and presents a slightly higher risk of an allergic reaction, but is still very safe. Intradermal testing is usually used to investigate allergies to certain medications or insect venom. The tests used are known as specific IgE tests or radioallergosorbent tests (RASTs). Patch tests are used to investigate a type of eczema known as contact dermatitis. A small amount of the suspected allergen is added to special metal discs, which are then taped to your skin for 48 hours and monitored for a reaction. This test is usually carried out at a dermatology (skin) department in a hospital. A food challenge may be used to diagnose a food allergy if skin and blood tests have not given a clear diagnosis. During the test, you're given the food you think you are allergic to in gradually increasing amounts, to see how you react under close supervision. This test is riskier than other forms of testing, but is the most accurate way to diagnose food and certain medication allergies. The use of commercial allergy-testing kits is not recommended. These tests are often of a lower standard than those provided by an accredited private Physician. Allergy tests should be interpreted by a qualified professional who has detailed knowledge of your symptoms and medical history.